Soothe and repair dry skin with the ESPA Dry Skincare Collection, a specially formulated trio of products that nourish, hydrate and condition the complexion for a healthier-looking visage. A mild and creamy cleanser that gently removes makeup and daily impurities, while also comforting and hydrating the skin. Rich Sweet Almond and Soya Bean Oils nourish, while Marshmallow and Chamomile help calm, comfort and soothe. An intensely hydrating overnight treatment mask to leave the complexion replenished and radiant. Chicory Root Extract helps to reinforce the skin's natural barrier function, while Konjac Root and Hyaluronic Acid hydrate and smooth. A pure blend including Cedarwood, Ylang Ylang and Lavandin Essential Oils help calm a busy mind while Encapsulated Lavender gently releases its soothing and restful properties as your head hits the pillow. Milk: Morning and evening, apply to fingertips and gently massage over face, neck and décolleté. Sweep away with a damp cotton wool pad or rinse with warm water. 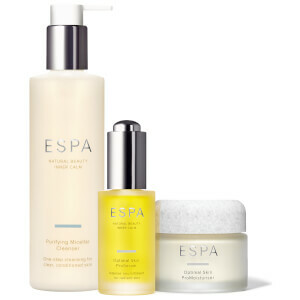 Follow with Hydrating Floral Spafresh and your favourite ESPA serum or face treatment oil and moisturiser. Spafresh: Apply to a dry cotton wool pad after cleansing and sweep over face, neck and décolleté to remove any last traces of cleanser. 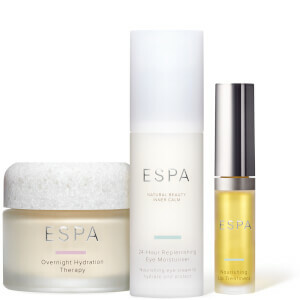 Follow with your favourite ESPA serum or face treatment oil and moisturiser. Apply throughout the day for an instantly hydrating mist, even over make-up. Therapy: Massage onto a clean face, neck and décolleté until the formula turns white. Allow five minutes for the treatment to sink in before retiring to bed. 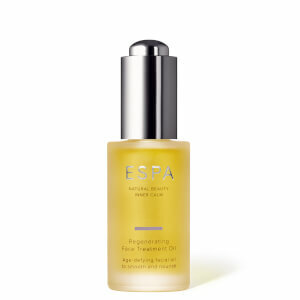 To enhance the benefits, apply over your favourite ESPA face treatment oil or serum. Milk: Water (Aqua), Glycerin, Glycine Soja (Soybean) Oil, Prunus Amygdalus Dulcis (Sweet Almond) Oil, Stearic Acid, Phenoxyethanol, Hydrogenated Ethylhexyl Olivate, Sclerotium Gum, Althaea Officinalis Leaf/Root Extract, Chamomilla Recutita (Matricaria) Flower Extract, Cetearyl Alcohol, Hydrogenated Olive Oil Unsaponifiables, Styrax Benzoin Gum, Xanthan Gum, Pelargonium Graveolens Flower Oil, Ethylhexylglycerin, Sodium Hydroxide, Citronellol, Geraniol, Linalool, Citral, Benzyl Cinnamate, Limonene. Therapy: Water (Aqua), Glycerin, Polyglyceryl-2 Stearate, Glyceryl Stearate, Stearyl Alcohol, Xylitylglucoside, Ethylhexyl Palmitate, Anhydroxylitol, Benzyl Alcohol, Xylitol, Ascorbyl Glucoside, Xanthan Gum, Lavandula Hybrida Oil, Linalool, Sodium PCA, Lavandula Angustifolia (Lavender) Oil, Dehydroacetic Acid, Eucalyptus Globulus Leaf Oil, Eugenia Caryophyllus (Clove) Leaf Oil, Cichorium Intybus (Chicory) Root Extract, Trihydroxystearin, Phenoxyethanol, Magnesium PCA, Eugenol, Hydrolyzed Yeast Protein, Caprylyl Glycol, Juniperus Mexicana Oil, Ethylhexylglycerin, Sorbitol, Zinc PCA, Abies Sibirica Oil, Cananga Odorata Flower Oil, Lecithin, Pelargonium Graveolens Oil, Pogostemon Cablin Leaf Oil, Acacia Senegal Gum, Limonene, Citric Acid, Sodium Benzoate, Tocopheryl Acetate, Geraniol, Glucose, Sodium Hyaluronate, Sodium Hydroxide, Manganese PCA, Evernia Prunastri (Oakmoss) Extract, Potassium Sorbate, Citronellol, Glyceryl Linoleate, Glyceryl Linolenate, Boswellia Carterii Oil, Bulnesia Sarmientoi Wood Oil, Cistus Ladaniferus Oil, Chitosan, Retinyl Palmitate, Sodium Ascorbyl Phosphate, Disodium EDTA, Chondrus Crispus Extract, Glyceryl Caprylate, Amorphophallus Konjac Root Powder.